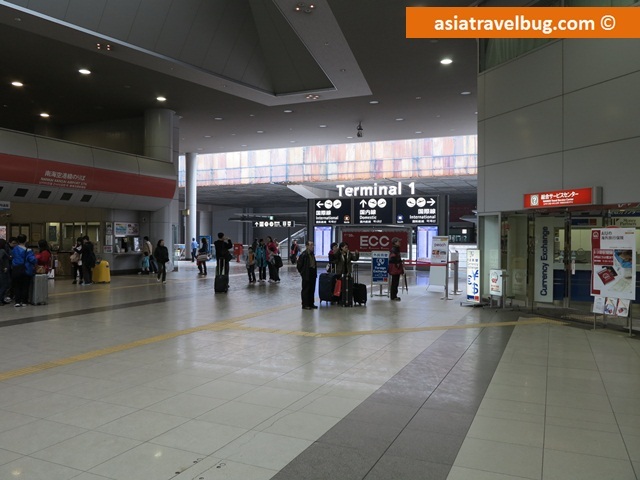 After a very turbulent flight, we finally landed in Kansai International Airport Terminal 1 close to 1:00 pm. It’s quite surprising to see that the airport was rather empty despite arriving in Osaka during super peak season. We were able to get through immigration, baggage claim and customs fairly fast! We took some maps from the Kansai Tourist Information Center before we headed out of the airport. The maps proved to be really helpful in our first Japan adventure especially during the times when we felt lost in Osaka, Kyoto and Nara. Next, we headed towards the train station to purchase airport transfer tickets from the Japan Railway (JR) Ticket Office. Learn more about Haruka Icoca Card in this blog and see how it can save your cost by half for transfers direct from Kansai Airport in Osaka to Kyoto Station. 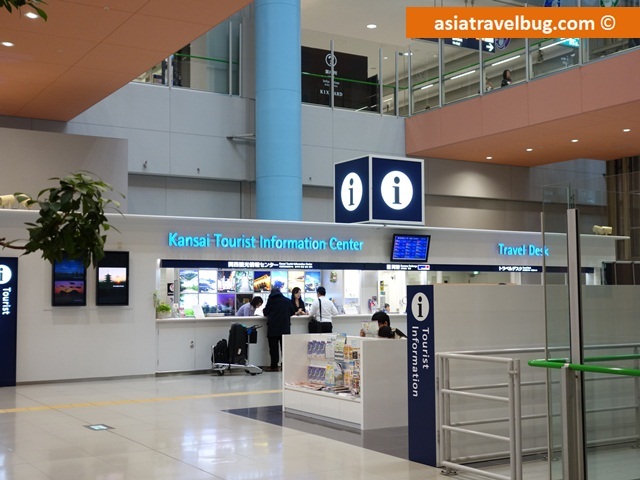 Just outside Kansai International Airport Terminal 1 is the JR Kansai Airport Ticket Station. We were greeted with a long queue with about 15 people in line in front of us. But thanks to the efficient staffs in the JR ticket station, we got our Haruka Icoca cards within 30 minutes! Haruka Icoca Card Package is a combination of a transit card (Icoca) and a deeply discounted Kansai Airport Express Train ticket (Haruka) from Kansai Airport in Osaka to Kyoto Station. Take note that the Haruka Icoca Card Package is only available to foreigners with short term stay. To be qualified, you need present your passport and return airfare upon purchase in the JR ticket station. Also, you can only purchase this package once throughout the duration of your stay. 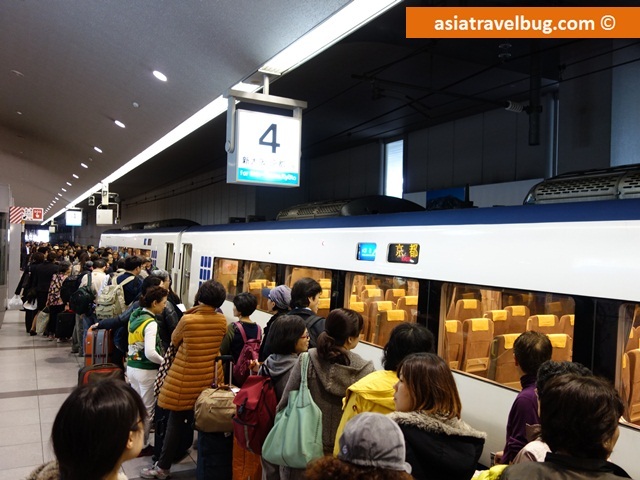 Asiatravelbug’s Japan Travel Tip: If travelling during peak season, you can reserve and purchase Sagano Scenic Railway tickets in JR ticket stations. We opted for the one-way Haruka Icoca Card Package since we will be returning to Kansai Airport from Namba station in Osaka, a station which is not covered by the Haruka Kansai Airport Express line. The one-way Haruka Icoca card costed us 3,000 yen each (~USD 30) which is fairly a good deal considering the following benefits. 1. 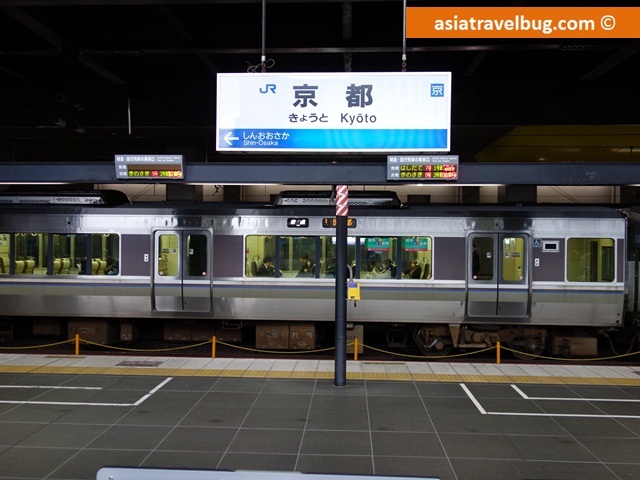 Reduced one-way ticket fare from Kansai International Airport to Kyoto Station at only 1,000 yen (~USD 10). This gave us 830 yen (~USD 8) discount per person since the regular one-way Haruka ticket costs 1,830 yen (~USD 18). This translates to 45% in savings. 2. 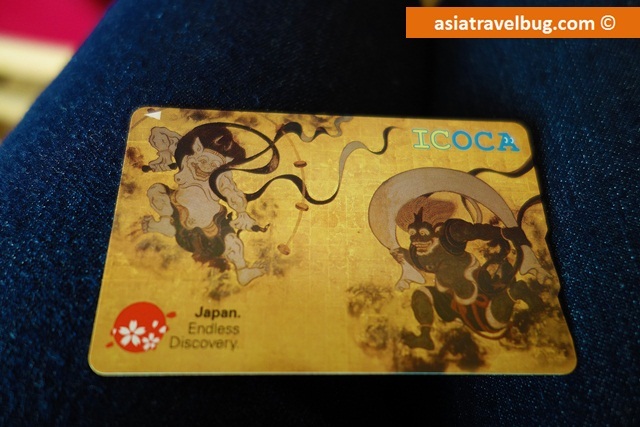 A prepaid Icoca card loaded with 1,500 yen (~USD 15). 3. A 500 yen (~USD 5) refundable Icoca card deposit. The Icoca card functions similar to Hong Kong’s Octopus prepaid card which can be used in trains (different train companies not just JR), buses, convenience stores, supermarkets and various shopping establishments. You can check train schedules using hyperdia. Asiatravelbug’s Japan Travel Tip: The Haruka Icoca Card Package is highly recommended by Asiatravelbug. Apart from 45% discount in Haruka Kansai Airport limited express ticket, the Icoca card is very convenient which you can use almost everywhere in Kansai region. Most of the unlimited rail passes offered by JR West are restricted to JR trains only. 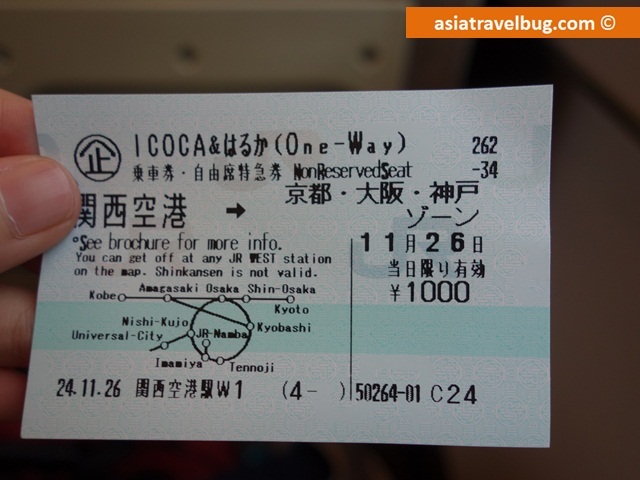 In Kyoto and Osaka, trains are operated by different train companies so having an Icoca card is the best bet to go. Also, you will only pay for what you use. So here’s the Haruka Kansai Airport Limited Express train bound for Kyoto. Due to high number of people wanting to see Kyoto’s famous autumn foliage, the train station looks a bit chaotic at first glance. However as the train approached, the passengers naturally formed a queue while waiting for the train doors to open. We got our first taste of Japanese discipline here. The inside of the train is very clean. The chairs are very comfortable and spacious, definitely a first class public transportation even for non-reserved seats. 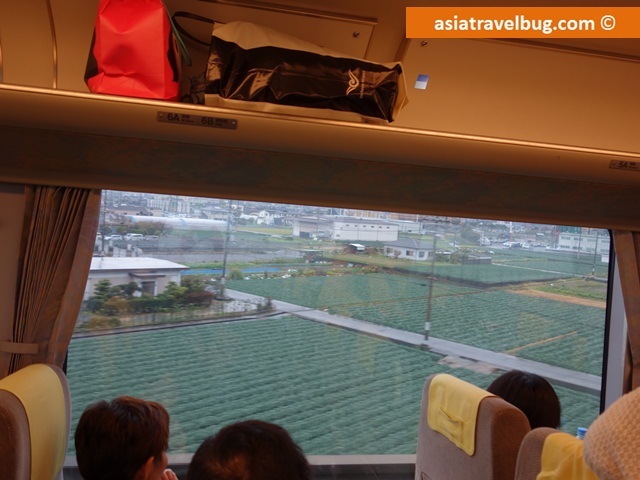 I was quite surprised to see lots of farmlands on our train ride to Kyoto. I think these are Japanese rice paddies. 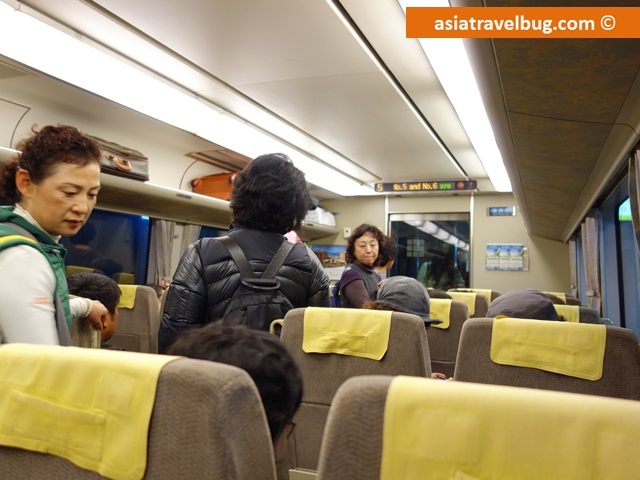 The 75-minute train ride from Kansai Airport to Kyoto flew by so quickly! Finally we arrived in JR Kyoto Station. 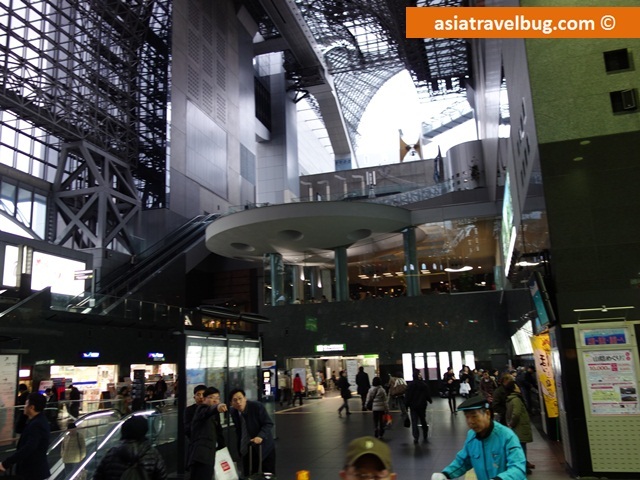 The JR Kyoto Station is huge and has some nice architecture. Since we have lots of luggage, we chose to take a cab to Hotel Monterey Kyoto. 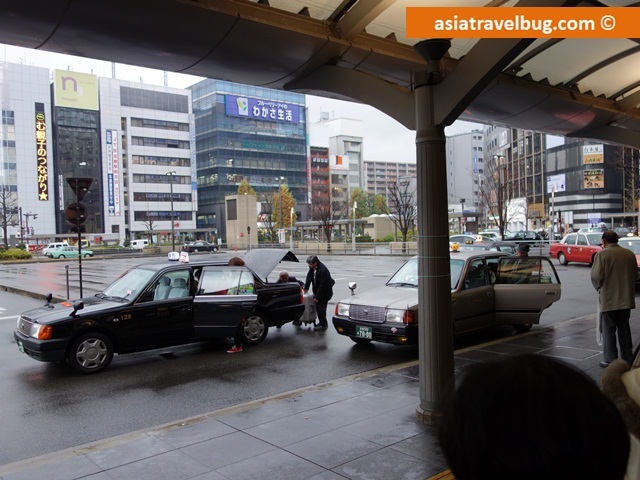 Here is the taxi bay just outside Kyoto train station, how convenient! Looking for a convenient place to stay in Kyoto? Search for Kyoto hotels from over 100 travel sites in one click here. Hi Tiffany! We will be arriving in KIX and then heading to Kyoto. I plan to see the major sites and also do a daytrip to Nara. We will be in Kyoto for 3.5 days. Then we plan to take the bullet train to Tokyo, spending 4 days there before flying out of Narita. I decided not to buy the Jr pass based on my travel because it’s not worth it. It seems for Kyoto, the haruka icoca pass is best for us? Can I return the pass at Kyoto station? Thanks. Yes, the Icoca & Haruka would be best for travel between KIX airport and Kyoto. You can actually use the Icoca reloadable transport card when in Tokyo but you won’t be able to refund it in Tokyo. If you wish to do a refund, you have to return it in a JR West Ticket Station while in Kyoto or Osaka. So yes, you can return it at Kyoto Station. Hi for HAruka Icoca Card, is it 1 card per person? when purchased in kansai Airport, where can we refund the refundable? can we refund it in Osaka or Tokyo? Hi Ann! Yes, it should be 1 per person. The Icoca card can be returned at any JR station in Osaka or Kyoto but not in Tokyo. I will be going to Kyoto and Osaka sometime in May. And it makes sense to get the ICOCA card with the Haruka. From KIX we go to Kyoto. Then go to Osaka. From Osaka back to KIX. Will I be able to use the ICOCA card to travel on Nankai Airport Express. Also if the seats in the Haruka is not reserved, where do you put your luggages? Is there an area to leave luggages? What is the best time/date during autumn to visit osaka & kyoto for their leaves colour change? Hi Wayne! This is Tiffy. The autumn foliage in Kyoto/Osaka varies per year. But based on my experience, the best time to go see the peak of autumn foliage in Kyoto is during the last week of November. I hope this helps in your planning! I will be travelling to Japan for the first time with my gf in the next 6 days and we had nothing planned! Basically we will be spending 2 nights in Osaka, 2 nights in Kyoto and den 3 Nights in Tokyo. May i know if the Karuka and Icoca card can be use in tokyo? Is it really tough getting around in japan? You can use the Icoca card in Tokyo but not the Haruka Pass. The Haruka pass can only be used from Osaka Airport to Kansai Area (Kyoto, Osaka, Kobe). It can be a bit of a challenge to get around Japan given complex train and metro systems especially in Tokyo. I suggest that you carefully plan your itinerary and commute plans ahead. Having a pocket wifi like Pupuru can be useful too so you can have access to google maps and hyperdia while on the go. I hope this helps and I’m sure you will enjoy your first trip to Japan as much as I did! Hi there.. My husband and I are planning to visit Japan sometime in Oct. Our itinerary includes Kyoto and Nara but we will be staying at Osaka. We wont be going straight from Kansai airport to Kyoto. We will be coming form Osaka Shin-imamiya station to Kyoto. Would you recommend us buying Karuka and Icoca cards? From what I know, the Haruka train ride that comes along with the Haruka Icoca Card package needs to start from Kansai Airport. With this, I think you are better off getting the Icoca card only. I hope this helps and I wish you a happy trip! Hi, would it be cheaper if we were to purchase return way from Kansai Airport -> Kyoto? Hi! Thanks for your dropping by my blog. People manning the Tourist Information Center and JR Airport Station in Kansai Airport can speak in English. I went to Japan as a non-Japan travel passport holder and went through the airport quite fast and hassle free. Generally, Japanese are quite efficient work-wise, so I think there is no need for you to worry whether the queues will be long in Kansai Airport. Thanks and have a nice trip! Do they speak English on Kansai Airport?? I’ll be flying to Japan on the 29th for the first time. :))) By the way I’m a Japanese Passport Holder do you have any tips for me to get through the airport hassle free??? Thank You!